NAIROBI, Kenya — Fulfilling the hopes of millions of Kenyans, Barack Obama returned to his father’s homeland Friday for the first time as U.S. president, a long sought visit by a country that considers him a local son. The president spent the evening reuniting with his Kenyan family, including his elderly step-grandmother who made the trip to the capital of Nairobi from her rural village. U.S. and Kenyan flags lined the main road from Nairobi’s airport, and billboards heralding Obama’s trip dotted the city. “I don’t think that Kenyans think of Obama as African-American. They think of him as Kenyan-American,” said EJ Hogendoorn, deputy program director for Africa at the International Crisis Group. Obama’s link to Kenya is a father he barely knew, but whose influence can nonetheless be seen in his son’s presidency. Obama has spoken candidly about growing up without his Kenyan-born father and feeling “the weight of that absence.” A White House initiative to support young men of color who face similar circumstances has become a project dear to Obama, one he plans to continue after leaving the White House. In Africa, Obama has used his late father’s struggle to overcome government corruption as a way to push leaders to strengthen democracies. He’s expected to make good governance and democracy-building a centerpiece of his two days of meetings and speeches in Nairobi, as well as a stop next week in Ethiopia. The president’s father, Barack Obama, Sr., left Kenya as a young man to study at the University of Hawaii. There, he met Stanley Ann Dunham, a white woman from Kansas. They would soon marry and have a son, who was named after his father. The elder Obama left Hawaii when he son was just two years old, first to continue his studies at Harvard, then to return to Kenya. The future president and his father would see each other just once more, when the son was 10 years old. Obama’s father died in a car crash in 1982, at age 46. What Obama uncovered was a portrait of a talented, but troubled man. An economist for the Kenyan government, the senior Obama clashed with then-President Jomo Kenyatta over tribal divisions and allegations of corruption. He was ultimately fired by the president, sending him into a tailspin of financial problems and heavy drinking. The Kenyan leader Obama will meet with this weekend, Uhuru Kenyatta, is the son of the president his father confronted decades ago. Obama met most of his Kenyan family for the first time on that initial trip to his father’s home country. As he stepped off Air Force One Friday, he was greeted by half-sister Auma Obama, pulling her into a warm embrace. The siblings then joined about three dozen family members at a restaurant at the president’s hotel for a private dinner. Logistical constraints and security precautions prevented Obama from visiting Kogelo, the village where his father lived and is buried, on this trip. Sarah Obama, the step-grandmother he calls “Granny,” still lives in the village. Despite the intense focus on the American leader’s local roots, the White House has cast the trip as one focused on the relationship between the U.S. and Kenya, not the president and his family. Officials say Obama’s agenda is heavily focused on trade and economic issues, as well as security and counterterrorism cooperation. The president is traveling with nearly two dozen U.S. lawmakers, along with 200 U.S. investors attending the Global Entrepreneurship Summit. Michelle Obama and daughters Malia and Sasha did not accompany the president. 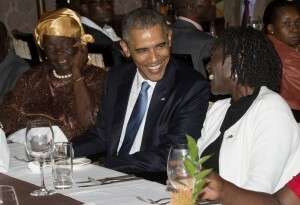 Auma Obama said she believed her late father would be proud to see his son return to Kenya as American president.